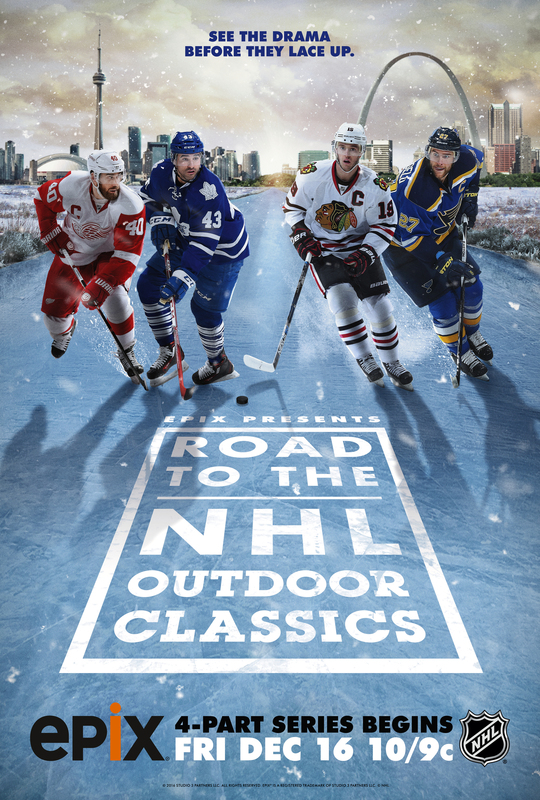 Produced by 54-time Emmy® award winner Ross Greenburg, narrated by Bill Camp (The Night Of, Jason Bourne, 12 Year’s a Slave) and presented in partnership with NHL Original Productions, EPIX Presents Road To the NHL Outdoor Classics will provide viewers with a sports tech-driven, intimate look at these athletes in their professional and personal settings, capturing all the action, drama, heartaches and triumphs as they unfold. The Red Wings, Maple Leafs and Blackhawks are all Original Six™ teams – having played in the NHL in the years prior to the League’s expansion in 1967. The St. Louis Blues joined the NHL that year and are celebrating their 50th anniversary this season. The Red Wings prepare for the 2017 Scotiabank NHL Centennial Classic™ as veterans of outdoor games, having played in the 2009 Bridgestone NHL Winter Classic® at Wrigley Field in Chicago (a win over the Blackhawks), the 2014 Bridgestone NHL Winter Classic® at Michigan Stadium in Ann Arbor, Mich. (a shootout loss to the Maple Leafs) and the 2016 Coors Light NHL Stadium Series™ at Coors Field in Denver (a win over the Colorado Avalanche). The Maple Leafs are making their second-ever outdoor game appearance following their victory over the Red Wings in 2014. The Blackhawks will play in their third NHL Winter Classic® on Jan. 2, 2017 (after their 2009 game at Wrigley Field and 2015 matchup with the Washington Capitals at Nationals Park in Washington, D.C.). In addition, the Blackhawks faced the Pittsburgh Penguins in the 2014 Coors Light NHL Stadium Series™ and the Minnesota Wild in the 2016 Coors Light NHL Stadium Series™. The Blues will play in their first-ever game outdoors.